On Saturday night at the Bank of Ireland Dr McKenna Cup Final in the Athletic Grounds, Armagh, Translink and Ulster GAA announced the overall winner of the Translink Ulster GAA Young Volunteer of the Year award. Cathal Mercer, 23, from Tir na nOg, Portadown was presented with the accolade at half-time during the game. The Young Volunteer award is designed to celebrate the contribution people aged 14-24 make to communities across the province. Each month during 2018, clubs were invited to nominate youth volunteers who play important roles in areas such as coaching, mentoring, fundraising, and organising social activities. A panel of experts met to select one overall winner for the year and Cathal came out on top. The panel was particularly struck by the breath of work he undertakes, attending games, writing match reports and keeping club members across the world up-to-date by regularly updating online networks. 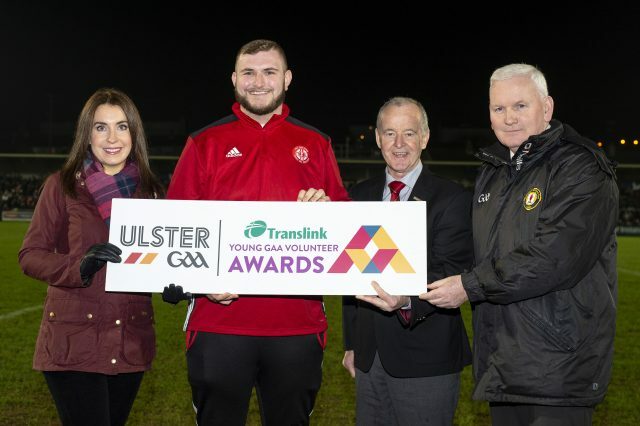 “This is the second time Translink has partnered with Ulster GAA to present this award and we are delighted to help them celebrate the importance of youth volunteering again. “We are absolutely delighted to award Cathal Mercer from Tír na nÓg with Translink Young Volunteer of the Year. When people think about volunteering in sport their immediate thoughts are coaching or games development but the GAA offers many more volunteering opportunities for people.